Manuale di Navigazione Aerea - navigazione-aerea's JimdoPage! il presente manuale è la versione riveduta e corretta del Manuale di Navigazione Aerea che ho scritto nell'ormai lontano 1994 e che è stato in uso presso il Centro Addestramento Alitalia per quasi due decenni. Sulla vecchia versione di questo manuale ha studiato una generazione di piloti e di flight dispatchers, ed è con vero piacere che lascio la consultazione di questa nuova versione alla libera fruizione di giovani piloti e appassionati di volo. Nonostante le continue innovazioni tecnologiche e procedurali, i fondamenti base della navigazione aerea sono sempre gli stessi, ed è per questo motivo che il manuale mantiene la sua attualità. Ho preferito creare un'edizione informatica piuttosto che cartacea, al fine di venire incontro ai ragazzi che anche con uno smart phone possono trovare utili indicazioni ed insegnamenti. Oltre 20.000 persone visitano questo sito ogni anno. La cosa non può che farmi piacere. Un caro saluto a tutti gli appassionati di volo!!! Un caro augurio di buono studio!!! Enrico Della Gatta was born in La Spezia, Italy in 1958. He attended the four years courses of the Italian Naval Academy from 1977 till 1981. In 1983, after two years of flight training with the US Navy, he received his Naval Aviator wings both as multi-engine aircraft and helicopter pilot. The Superior Course in the Naval Academy and several specialization training courses followed soon after. He served as ship-based helicopter pilot onboard Italian Navy ships until 1987, when he left active duty and was hired by Alitalia. From 1988 he flew as Copilot on MD-80, then from 1992 as First Officer on MD-11; he was then appointed Captain in 1998, and flew on MD-80 for the following five years, then on on Airbus 319, 320 and 321. From the beginning of 2017 he is flying as B-777 Captain on intercontinental routes. He has a total of more than 14.000 flight hours. He is the author of the Air Navigation Manual used by the Alitalia Flight Training Center, and has been Air Navigation Instructor for several foreign airlines. From the beginning of his career in Alitalia he has been involved in flight safety issues as Vice-Director of the Technical Department of the largest Italian Pilot Association. 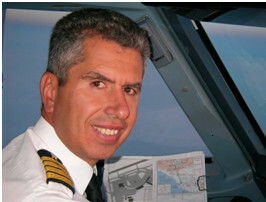 After his appointment as Captain he started his duty in the Safety and Quality Department of Alitalia. He is Quality Auditor, Aeronautical Accident Investigator, and ICAO and ENAC Security instructor. He has been working for the establishment of the Alitalia Group Crisis Management Department since its start. The objective was to have manuals, training, organization, and personnel in line with the state of the art of the industry, in order to have a credible and efficient emergency response organization that can properly face the organizational, legal and human issues that follow an emergency situation and a good and reliable Business Continuity plan. In the new Alitalia he was Head of Crisis Management until the end of 2010, responsible also of the development of the Business Continuity Plan and the automation of emergency response procedures. Within IATA he has been Member of the Steering Committee in the Emergency Response Planning Working Group, has been elected Vice Chairman from 2002 to 2004 and again Vice Chairman and then Chairman until 2008. In 2010 he was elected Chairman of the “Emergency Response Procedures - Functional Expert Group” of SkyTeam. He was the Safety & Compliance Monitoring Manager (ex Quality Manager) of CAI First (Alitalia Group) until March 2015. He was the Flight Data Monitoring Operational Expert within the Flight Alitalia Safety Department until 2016. He is the Alitalia representative in the IRIS consortium, a project sponsored by the European Space Agency for the satellite communications and modernization of Air Traffic Control, and Company responsible for SESAR and Single European Sky matters. He has been teaching Emergency Response Planning in a Security Master at Roma University and Emergency Response and Business Continuity Planning in a Master at Palermo Engineering University. He has a degree in Nautical Sciences, from Pisa University, a degree in Political Sciences from Trieste University and a degree in Law from Rome University. He is a Lawyer specialized in Air Navigation and family matters. He teaches Emergency Response at the Italian Flight Safety Committee Safety Management System and Crisis Management courses, and is called to numerous international meetings as speaker. He cooperates with public institutions for Critical Infrastructures protection and is called as consultant for the development and testing of Emergency Response Plans.